Amplitude, A is the maximum displacement of a particle from the equilibrium position. The amplitude is a measure of energy carried by the wave. The higher the wave energy, the higher the amplitude. 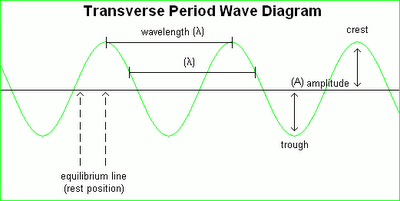 Wavelength is the distance between two adjacent crests or troughs. Period, T is the time taken for a complete oscillation of a particle of a wave. 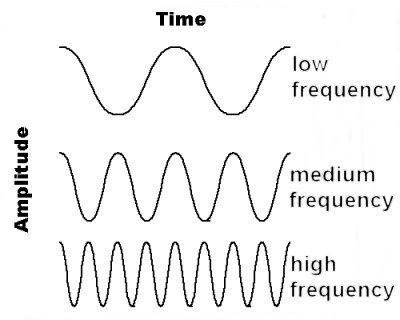 Frequency, f is the number of complete oscillations performed by a particle of a wave in one second. I am not as smart as Albert Einstein. He was the best scientist ever produced by God. In fact, I am just an ordinary teacher. explain why the amplitude of water waves is smaller in deep area than shallow area? Thanks. As waves travel from deep to shallow water, their shape alters such as amplitude increases, speed decreases, and its wavelength decreases. Varying depths along a wave crest cause the crest to travel at different phase speeds, with those parts of the wave in deeper water moving faster than those in shallow water. This process continues until the crests become (nearly) parallel to the depth contours. Rays—lines normal to wave crests between which a fixed amount of energy flux is contained—converge on local shallows and shoals. Therefore, the wave energy between rays is concentrated as they converge, with a resulting increase in amplitude. Mr/Mrs Wong, can u pls explain how water waves travel more slowly in shallow water than in deep water? how can a student reduce the wavelength of the wave? 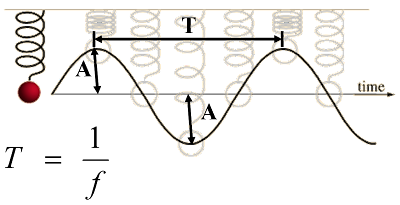 The direction of propagation of wave should be perpendicular to the vibration of particles if the wave is transverse wave. hye cikgu wong =) what is displacement-time graph and displacement distance graph shows?? Cikgu Wong,are the velocity=speed and besides ? and will there's a question that asking for a 'velocity' in this chapter ?